S.T.A.R. is brand new training and peer to peer mentoring program designed specifically for managers/site-level supervisors. S.T.A.R. stands for Strategies, Training, Action Plans, and Resources. It is designed to help managers develop goals and best practices to improve program administration and operations through unique training, technical assistance, and professional development over 12 months. 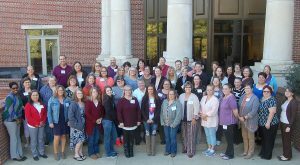 ICN hosted 60 child nutrition professionals from the state of Kansas for a 2 1/2 day S.T.A.R. pilot session. Click below to learn more and watch some testimonials from participants.